무덤 - 습격과 정글 탐험의 솔로 게임. 성전을 입력 이슈 잡아 - 골든 아이돌과 화가 원주민과 배고픈 정글 동물이 당신을 잡기 전에 착륙 지점에 다시 확인! 주머니에 해적 새 테마를 강화하기 위해 다시 구현 한 테마와 몇 가지 규칙 변화와 주머니에 좀비의 변형이다. 이들의 가장 중요한 당신이 골든 아이돌과 분노 어둠이 점거 할 때까지 최후의 날 시계를 시작하는 사원의 고대 신들을 훔칠 때 ... 당신이 비행기로 다시 만들 것입니다 트리거 특수 4 시간 "폭풍"이다 시간에? 보드 게임 구스타보 Herodier의 디자이너. A solo game of tomb-raiding and jungle exploration. Enter the temple, grab the Artifact - Golden Idol and make it back to the landing site before the angry natives and hungry jungle critters catch you! 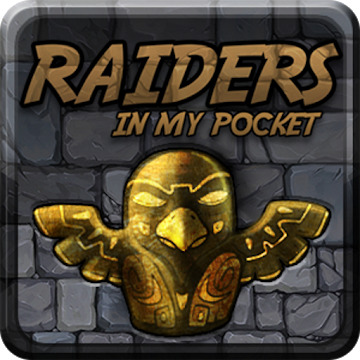 Raiders in my Pocket is a modification of Zombie in my Pocket, with a re-implemented theme and some rules variations to reinforce the new theme. Most significant of these is the special 4th time period "Storm", which triggers when you steal the Golden Idol and anger the ancient gods of the temple, starting a doomsday clock until darkness takes over... will you make it back to the plane on time? Designer of board game Gustavo Herodier.